Four men have appeared in court in the first crown court criminal trial to be held without a jury in England and Wales for more than 350 years. The case concerns four men accused of a £1.75m armed robbery at a cash depot at Heathrow Airport, west London, in 2004. Last June, Lord Chief Justice Lord Judge made legal history by allowing the trial to be heard by a judge alone as he feared jury "tampering". One of the accused men's barristers said: "We are breaking history." John Twomey, 61, of New Milton, Hampshire, Barry Hibberd, 43, of Shepherd's Bush, west London, Peter Blake, 57, of Notting Hill, west London, and Glen Cameron, 50, also from New Milton, all deny several charges including robbery and firearm possession. Those at the first crown court criminal trial without jury in England and Wales for more than 350 years were acutely aware of its significance. Sam Stein QC talked of "breaking history". The wooden benches in courtroom 35 remained empty of the usual 12 ordinary men and women of the jury. Mr Justice Treacy asked that normal procedure be adapted to allow him to decide whether the four defendants were guilty. They sat in front of those empty jury benches, listening impassively to the prosecution case. The public gallery was only half full in this impressive courtroom, in an annexe to the courts which conjures images of Harry Potter's Hogwarts school. Outside, supporters of the accused protested at the "kangaroo court". Inside, business continued. It may lack the drama of a case which will culminate in a jury-delivered verdict but nonetheless it was well worth a ringside seat for such a departure from legal history. It is the fourth trial connected to the robbery. As the trial began Sam Stein QC, representing Mr Hibberd, remarked: "We are breaking history. This is the first time that a court has started a jury-less trial." As prosecution barrister Simon Russell Flint QC was about to open the case, the judge explained how he had decided to adapt the normal procedure by which juries are given responsibility for a case. "At this stage the defendants would have been put in the charge of the jury and, although it is not apparently a strict legal requirement that they are," he said. "I have asked the court clerk to adapt the normal formula and to put me in charge of the various counts on the indictment." Instead of reading out all 18 charges as she would have done to the jury, the clerk simply asked the judge to confirm he had seen the indictment. She then informed the judge the defendants had pleaded not guilty and that it was in his charge to say whether they were guilty or not - the task usually given to jurors. The court heard how the gang of armed robbers tried to steal more than £10m from a warehouse at Heathrow Airport. But there was only £1.75m there at the time, as one of the gang members had misunderstood a document, said Mr Russell Flint. "This was a professionally-planned and professionally-executed armed robbery," he said. BBC legal affairs analyst Clive Coleman said trial by jury was a hallowed principle stretching back to the Magna Carta in 1215. But he said if - as Lord Judge found in this case - there was a real and present danger of jury tampering, which could not reasonably be protected against, trial by jury was limited by recent legislation. In June, Lord Judge said the cost of the measures such as the services of police officers needed to protect jurors from potential influence was too high. He also said that such measures might not properly insulate the jury. The trial will be the first crown court case in England and Wales to be heard by a judge alone, using powers under Sections 44 and 46 of the Criminal Justice Act 2003 that came into force in July 2007. 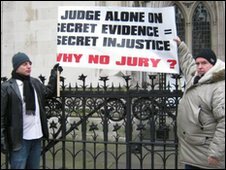 Trials without a jury are a more regular feature of justice elsewhere in the UK. Diplock courts have been used in Northern Ireland since 1973 in an effort to combat jury intimidation by paramilitary groups. But in June 2009, Justice Minister Paul Goggins said the system would only be retained for two more years. And some criminal cases in Scotland are heard by a sheriff in the sheriff court or by a bench of one or more lay justices, in justice of the peace courts. 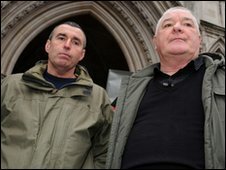 As the trial began at the Royal Courts of Justice, a group of friends and supporters of the defendants protested outside. Brian O'Callaghan, a family friend of John Twomey, said: "We are doing this so that a democracy doesn't turn into a dictatorship."